The games industry is a multi-billion dollar business bursting at the seams with fantastic games on a variety of genres including puzzle, multi platform and virtual world to name but a few. 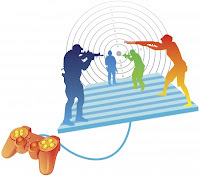 Internet games fit into a variety of platforms one popular type being the multi-player variety. There are of course email based games too as well as handheld varieties through the iOS and Android operating systems. Lots of choice and ideas, many important decisions need making if you want to become the next big multi-player games developer. To be a multi-player developer you first need to decide what kind of game you want to create. Do some research, this is vital. Find out what’s hot and what’s not, do you want to create an intense virtual world or small game offered free but with using lots of brand advertising to create revenue. Lot’s to think about! The bigger games don’t tend to be web based; the purchaser buys the game often in CD or DVD-ROMs and encourages their friends to do the same, connecting socially in the evening from their own homes. Take a look at the site MPOGD which will show you a massive variety of multi-player games to inspire you; maybe you already have an idea. You will need a server if you are going to develop any web based game and offer multi-player options. If you wanted you could choose to do that through shared hosting, the downside is the severe loss of speed. It’s going to be sloooow. It is far superior to rent a server or if you have the cash, and it is expensive… buy your own. It depends on how confident you feel in your abilities and how much finances you have. Maybe you have a friend who fancies partnering you in your venture. Two heads can be better than one. At first it is likely to be a brilliant idea to create a turn based game, unless you are bursting with personal programming confidence. I hope you don’t think I’m saying that you aren’t an excellent Flash developer and can’t write good server code as well; I’m sure you can and have the aptitude to be a huge success. Just make sure you can run before you can fly. Game creation, especially multi-player is such a popular field of computer development and the market is saturated. How about creating a multi-player game on the iOS operating system? There are also protocol options for getting the software to communicate with the android operating system for greater target reach but this is tricky. YAML and JSON are two particularly good ones to look at in terms of coding if you’re familiar with either of them. One particularly good website considered to be a market leader in free game development for iOS and Android is Score Loop. Worth a look whilst deciding how you want to pursue your ambitions for creating the next celebrated multi-player game. Think carefully, gather one fantastic imaginative original idea and go for it! The article is being written by Jason Phillips. He is a video game developer and owns an institute for developing video games. His student recently developed a new game for Zombie Games 365. As much as I want to develop games, I'm just too lazy to look at code..hahahaha. pero enjoyable naman ang coding.